Verwendungszweck Human Angiogenin ELISA Kit for cell culture supernatants, plasma, and serum samples. Spezifität This ELISA kit shows no cross-reactivity with any of the cytokines tested: Human BDNF, BLC, ENA-78, FGF-4, IL-1 alpha, IL-1 beta, IL-2, IL-3, IL-4, IL-5, IL-7, IL-8, IL-9, IL-11, IL-12 p70, IL-12 p40, IL-13, IL-15, I-309, IP-10, G-CSF, GM-CSF, IFN-gamma, Leptin (OB), MCP-1, MCP-2, MCP-3, MDC, MIP-1 alpha, MIP-1 beta, MIP-1 delta, PARC, PDGF, RANTES, SCF, TARC, TGF-beta, TIMP-1, TIMP-2, TNF-alpha, TNF-beta, TPO, VEGF. Hintergrund Angiogenesis is the preferred term for processes leading to the generation of new blood vessels through sprouting from already existing blood vessels. The processes involve the migration and proliferation of endothelial cells from pre-existing vessels. Angiogenic factors are of clinical significance because they may be used to interfere directly with angiogenic processes involved, for example, in wound healing, inflammatory diseases, ischemic heart and peripheral vascular diseases, and myocardial infarctions. The Human Angiogenin ELISA (Enzyme-Linked Immunosorbent Assay) kit is an in vitro enzyme-linked immunosorbent assay for the quantitative measurement of human Angiogenin in serum, plasma, cell culture supernates and urine. This assay employs an antibody specific for human Angiogenin coated on a 96-well plate. 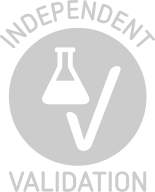 Standards and samples are pipetted into the wells and Angiogenin present in a sample is bound to the wells by the immobilized antibody. The wells are washed and biotinylated anti-human Angiogenin antibody is added. After washing away unbound biotinylated antibody, HRP-conjugated streptavidin is pipetted to the wells. The wells are again washed, a TMB substrate solution is added to the wells and color develops in proportion to the amount of Angiogenin bound. The Stop Solution changes the color from blue to yellow, and the intensity of the color is measured at 450 nm. Reproducibility: Intra-Assay: CV<10% Inter-Assay: CV<12%. Bring all reagents and samples to room temperature (18-25 °C) before use. 2. Sample dilution: If your samples need to be diluted, Assay Diluent A (Item D) should be used for dilution of serum/plasma samples. 1x Assay Diluent B (Item E) should be used for dilution of culture supernatants and urine. Suggested dilution for normal serum/plasma: 1,000-10,000 fold. Please note that levels of the target protein may vary between different specimens. Optimal dilution factors for each sample must be determined by the investigator. 3. Assay Diluent B should be diluted 5-fold with deionized or distilled water. 5. If the Wash Concentrate (20x) (Item B) contains visible crystals, warm to room temperature and mix gently until dissolved. Dilute 20 ml of Wash Buffer Concentrate into deionized or distilled water to yield 400 ml of 1x Wash Buffer. 6. Briefly spin the Detection Antibody vial (Item F) before use. 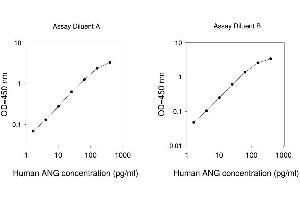 Add 100 µL of 1x Assay Diluent B into the vial to prepare a detection antibody concentrate. Pipette up and down to mix gently (the concentrate can be stored at 4 °C for 5 days). The detection antibody concentrate should be diluted 80-fold with 1x Assay Diluent B and used in step 4 of Part VI Assay Procedure. 7. Briefly spin the HRP-Streptavidin concentrate vial (Item G) before use. HRP-Streptavidin concentrate should be diluted 700-fold with 1x Assay Diluent B. For example: Briefly spin the vial (Item G) and pipette up and down to mix gently . Add 20 µL of HRP-Streptavidin concentrate into a tube with 14 ml 1x Assay Diluent B to prepare a final 700 fold diluted HRP-Streptavidin solution. Bring all reagents and samples to room temperature (18 - 25 °C) before use. It is recommended that all standards and samples be run at least in duplicate. 2. Add 100 µL of each standard (see Reagent Preparation step 2) and sample into appropriate wells. Cover well and incubate for 2.5 hours at room temperature or over night at 4 °C with gentle shaking. 3. Discard the solution and wash 4 times with 1x Wash Solution. Wash by filling each well with Wash Buffer (300 myl) using a multi-channel Pipette or autowasher. Complete removal of liquid at each step is essential to good performance. After the last wash, remove any remaining Wash Buffer by aspirating or decanting. Invert the plate and blot it against clean paper towels. 4. Add 100 µL of 1x prepared biotinylated antibody (Reagent Preparation step 6) to each well. Incubate for 1 hour at room temperature with gentle shaking. 6. Add 100 µL of prepared Streptavidin solution (see Reagent Preparation step 7) to each well. Incubate for 45 minutes at room temperature with gentle shaking. 8. Add 100 µL of TMB One-Step Substrate Reagent (Item H) to each well. Incubate for 30 minutes at room temperature in the dark with gentle shaking. 9. Add 50 µL of Stop Solution (Item I) to each well. Read at 450 nm immediately. Calculate the mean absorbance for each set of duplicate standards, controls and samples, and subtract the average zero standard optical density. Plot the standard curve on log-log graph paper or using Sigma plot software, with standard concentration on the x-axis and absorbance on the y-axis. Draw the best-fit straight line through the standard points. Sensitivity: The minimum detectable dose of Angiogenin is typically less than 1.5 pg/mL. Informationen zur Lagerung The entire kit may be stored at -20°C for up to 1 year from the date of shipment. Avoid repeated freeze-thaw cycles. The kit may be stored at 4°C for up to 6 months. For extended storage, it is recommended to store at -80°C. Produkt verwendet in: Atesoglu, Tarkun, Mehtap, Demirsoy, Atalay, Maden, Celebi, Hacihanefioglu: "Serum Angiopoietin Levels are Different in Acute and Chronic Myeloid Neoplasms: Angiopoietins do not only Regulate Tumor Angiogenesis." in: Indian journal of hematology & blood transfusion : an official journal of Indian Society of Hematology and Blood Transfusion, Vol. 32, Issue 2, pp. 162-7, 2016 (PubMed). Koob, Lim, Massee, Zabek, Rennert, Gurtner, Li: "Angiogenic properties of dehydrated human amnion/chorion allografts: therapeutic potential for soft tissue repair and regeneration." in: Vascular cell, Vol. 6, pp. 10, 2014 (PubMed). Pflum, Palumbo, Li: "Adverse effect of demineralized bone powder on osteogenesis of human mesenchymal stem cells." in: Experimental cell research, Vol. 319, Issue 13, pp. 1942-55, 2013 (PubMed). Steed, Trumpower, Duffy, Smith, Marshall, Rupp, Robson: "Amnion-derived cellular cytokine solution: a physiological combination of cytokines for wound healing." in: Eplasty, Vol. 8, pp. e18, 2008 (PubMed). Allgemeine Veröffentlichungen Oh, Park, Song, Lee, Cho, Kim, Chu, Choi, Park: "Radiation-induced angiogenic signaling pathway in endothelial cells obtained from normal and cancer tissue of human breast." in: Oncogene, Vol. 33, Issue 10, pp. 1229-38, 2014 (PubMed). Polverini, Bouck, Rastinejad: "Assay and purification of naturally occurring inhibitor of angiogenesis." in: Methods in enzymology, Vol. 198, pp. 440-50, 1991 (PubMed).